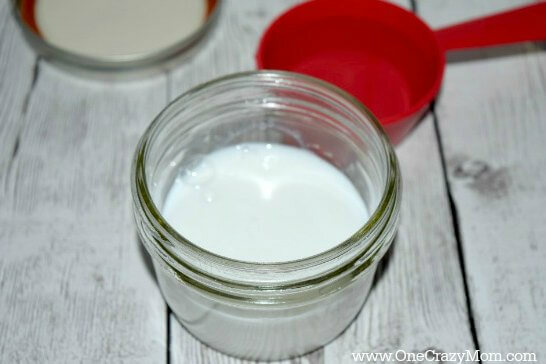 How to Make Homemade Mod Podge- Only 2 ingredients! I love being crafty and most of the time those crafty projects require the use of a magical product called Mod Podge. I love Mod Podge and it can be used on so many surfaces making it easy to work with, but it can be quite expensive. My bottle of Mod Podge was getting low so I decided to try to whip up my own batch of Homemade Mod Podge and it turned out perfect. 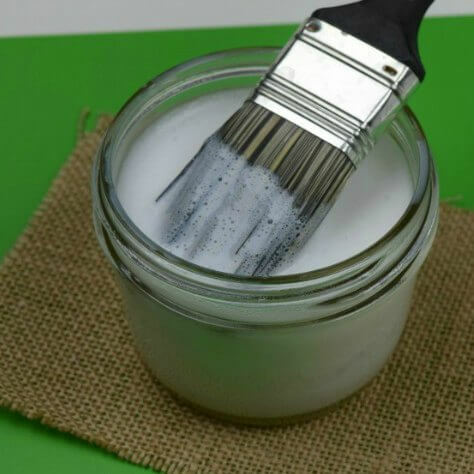 With the use of glue and water you’ll be on your way to a Homemade Mod Podge that costs $1.00 instead of $9.00. You really can’t get much cheaper than this. 1 Bottle washable glue, 6 oz. (purchased at $0.99 store) – Don’t forget during back to school season you can get glue for $.25 and $.50. 1. Grab your ½ pint mason jar and remove the lid. 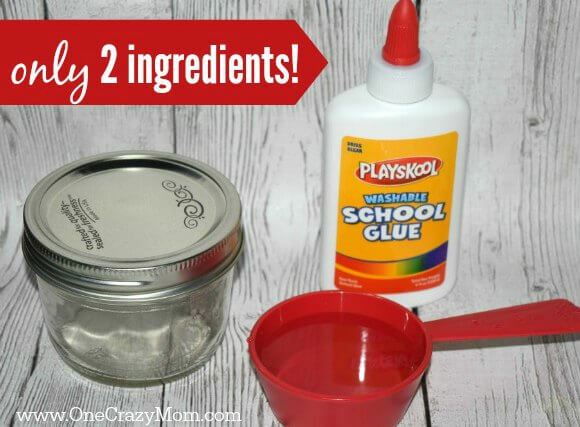 Pour an entire bottle of washable kids glue to fill up the mason jar. 2. Now grab your cup of water and pour it on top of your glue. Apply your lid to the mason jar and shake it for a good minute. 3. By shaking it up you’ll be mixing the contents together which is creating our Homemade Mod Podge. 4. Remove the lid, dip in your paint brush and get crafty. Enjoy. That is it! 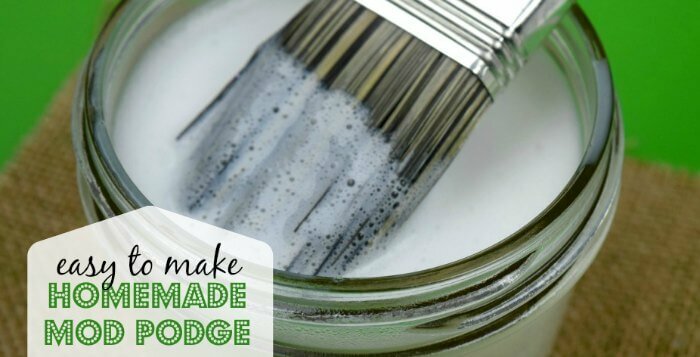 It really is that easy to make homemade mod podge! Learn how to make glue. 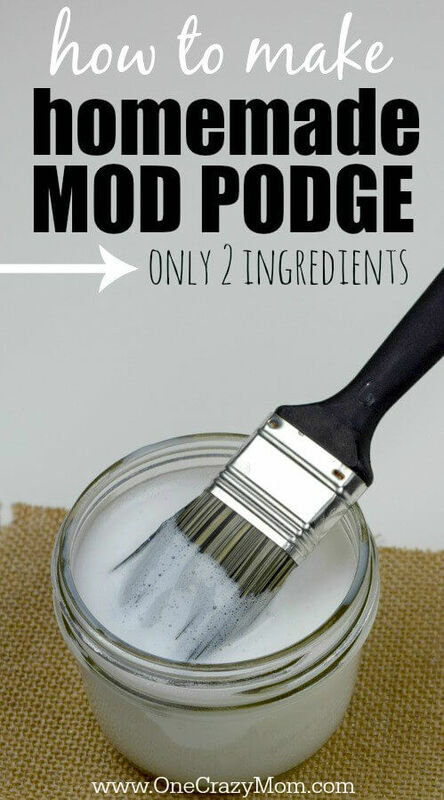 Now that you know how to make homemade mod podge, you will save so much money! Made it and it worked great. Will Elmer’s Glue-All work? Instead of school glue? Cindy – Yes, it should work great! Love Pinterest and all the wonderful things it can teach me. Thanks so much for the great ideas. Thank you for the great advise. One thing I would do is pour the water in the glue bottle before I add it to the jar and that way get even more glue out of the bottle. Or leave the bottle upside down draining before finishing it off. I am all about getting every last drop out of bottles that I can. Love your low-budget, easy to do diy projects! Wow! The diversity of themes are awesome! Thank you for sharing! God bless ya! I do so much crafting w/ my grand dghtrs..so whenever I can save $$ I’m happy. Thk u so very much!! Well I have put off doing a lot of craft because Mod podge was so expensive, but not anymore . Thank you for the hint. Did you ever tried to transfer a photo onto wood, done with homemade mod podge? does it work? love this I use mod podge a lot! thank you. Wow, this came along at just the right time! I was down to the last 1/4″ of my Mod Podge, 11 p.m., and needed to finish a project! Thanks for this! So simple and so economical. Now I can make my own Mod Podge any time. Woo-hoo!! Thank you for this! I can’t find it on line here in the UK and this will save me a small fortune! I decoupage and get through a ton of glue…thanks! Whoo hooo … Thank you!!! Thank you. Could this be used instead of puzzlecoat or puzzle glue? Can it be applied in several coats like ModPodge? I have been gluing puzzles together with glue alone for always! so modge podge would def work. What is ratio of glue to h2o? Is that 4 oz glue bottle? Most are three or four oz. 3 parts blue to 1 part water is what I use. Hi Carrie. I’m from SouthAfrica and I thank you for showing me how to make home made modge podge. It is very expensive here. Bless you. You saved my life. Thanks for this. My I suggest the water first be put into the empty glue bottle to rince out the remaining glue, then added to the 1/2 pint jar with the glue. What size bottle glue do you use? Many woo-hoos!!!! I knew Modge Podge smelled just like white glue, but never thought to try recreating it. You’ve saved us all some big bucks. Kudos! I have just started making paper beads. Everything has a coat of mod podge on it. Thanks for the receipe. woo hooo¡¡¡ muchas gracias, en verdad sera de gran ahorro y ademas no es facil estar yendo a las tiendas a conseguirlo. That’s super quick & super easy…. Thanx a ton…! 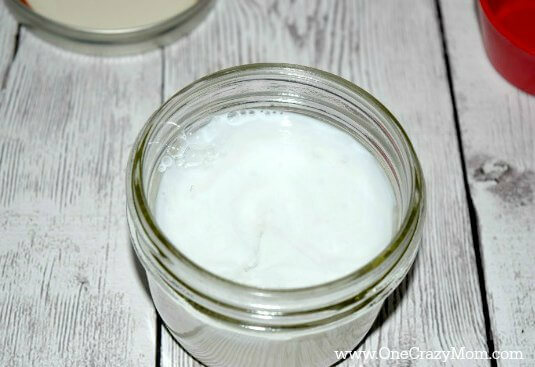 Put Vaseline around the outside of the jar where the lid goes on and the inside of the lid. It won’t get stuck. This is fabulous. Thanks for sharing. Woot woot!!! Thanks so much for that awesome tip!!!! Trying to make crafts to sell to pay some bills! I also enjoy this kind of stuff. Your tip will help me a lot! I appreciate that so much!!! Woooooooooooooooooooooooooooooooooooooooo, thank you so much.Perfect!!!! Just wondering if this works for mugs and is it dishwasher safe? Raya – It’s not dishwasher safe since it’s water base so I would not use this on mugs. Thank you.